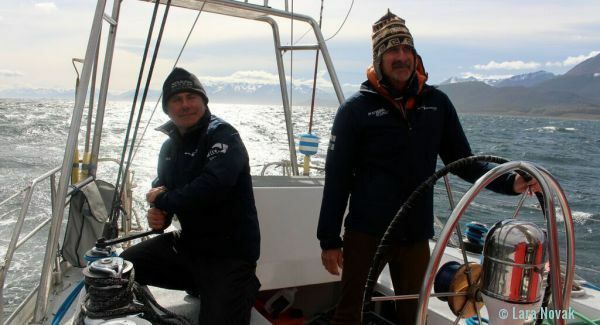 We left Cape Town in mid-December en route for the Falkland Islands, where Port Stanley was to be our point of departure for a three-week voyage to Tierra del Fuego on board the sailing vessel Pelagic. 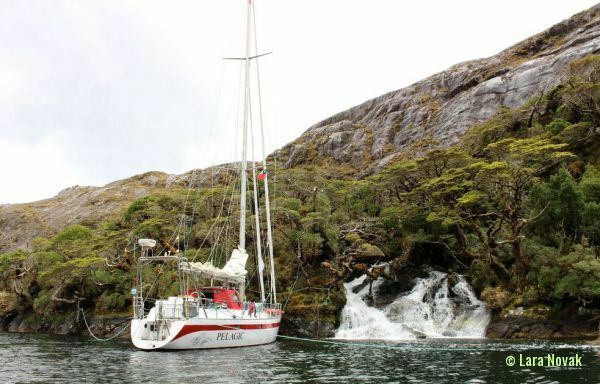 We were to follow in the footsteps of Charles Darwin and Captain FitzRoy, sailing through the Beagle Channel and exploring the fjords by sea and the hinterland on foot. Sailing experience recommended but not necessary. All nights to be spent in spectacular settings with no anchor watch necessary! Accommodation simple yet splendid. LIVE THE DREAM! 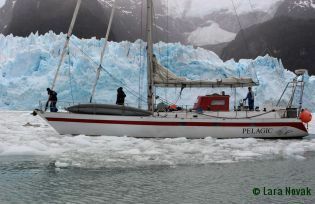 It all began with a gift that my husband Marco had received from our good friends Skip Novak and his wife, Elena Caputo, both die-hard sailors: it was a voucher entitling him to a cruise on board the Pelagic, based in South America, in the company of their family. Skip works as an expedition leader, often combining mountaineering with sailing, in those parts of the world that are so unfriendly to humans that they have never been colonized. He built his expedition yacht Pelagic in 1987 and spends every season in Antarctic waters. Like us, Skip, Elena and their children are based in Cape Town. From Port Stanley, our voyage would take us along the northern coast, to Carcass and Jason Islands, crossing over to South America and entering the Magellan Strait between Argentina and Chile. 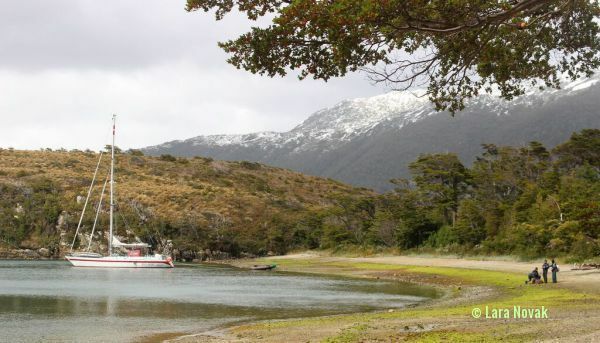 We were to sail all the way through to the Pacific and from there into the fjords of the Tierra del Fuego in southern Chile, through the Beagle Channel, all the way to Port Williams, the most southern city in the world. Our route from Port Stanley to Puerto Williams. 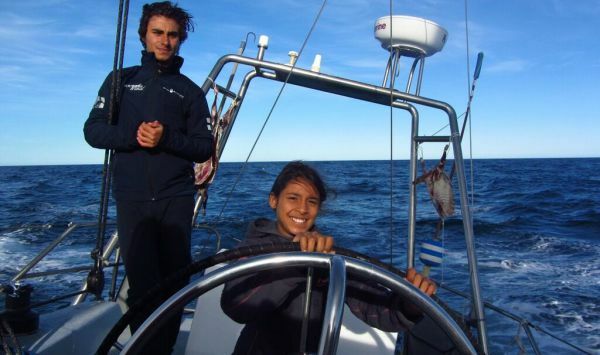 Marco, our children Livio (14) and Ghita (9) and myself left Cape Town on 17 December 2015. It took us five airplane rides to reach the Falklands, via Johannesburg, Sao Paolo, Santiago and Punta Arenas. A two-night stopover in Santiago gave us an extra day as a safety buffer: we could not risk missing our ongoing flights to the Falklands, which leave only once a week. We also could not risk a delay to our luggage, packed with all our special weather-proof gear, including our amazing Muckboots, half-rubber and half-neoprene, with which we could walk in the water, on ice, in mud and on board, easy to slip on and off. 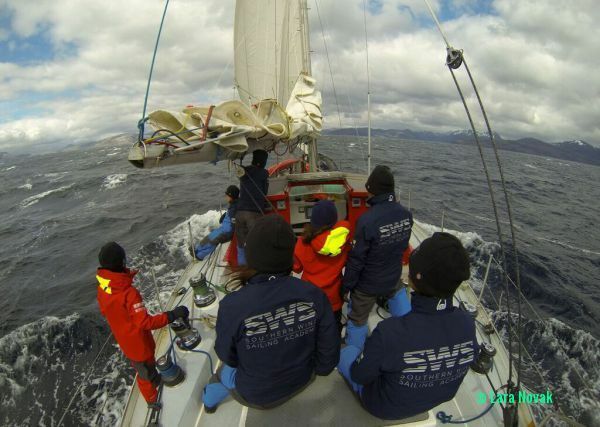 We had windproof jackets sponsored by Southern Wind Shipyard and Sail Racing, whom we provided with photos of our trip to use for promotion. These windproof jackets were a discovery for me: it doesn’t matter how many layers you wear, what is crucial is sealing out the icy wind effectively. We all had several pairs of gloves, caps, and sunglasses, another essential item at sea and on ice. Plus hiking boots, sleeping bags and thermal underwear, all of vital importance to our trip. We spent our day in Santiago strolling through the city centre, listening to bands playing live street music, with people dancing joyfully in couples. We climbed up a hill to the devotional sanctuary of the Immaculate Conception, and had an ice cream in a crowded shopping centre, which seemed so familiar that we felt it could have been anywhere. Globalization makes travelling just a little less exciting after all. We took metros and buses and saw lots of monumental statues in different squares, plenty of horse riders: some proud and noble and others tired and defeated. We were amazed by the size of an enormous Chilean flag in front of the parliament. There was a market where old ladies sat knitting and selling their sewing work. We had supper in the Municipal Gardens behind the Museum of Contemporary Art. Overall Santiago had a nice vibe, friendly people, not too chaotic but chaotic enough to be a lively city. We left early the next morning for Mount Pleasant in the Falklands, where we were received by the military. One of my suitcases was intercepted by an airport drug dog, who got obsessed with it…having emptied the contents, it turned out that the dog was actually only interested in the empty suitcase. In the harbour capital of Stanley, we met up with the Novak family, who gave us a warm welcome on the Pelagic, anchored in the outer port on the other side of the bay. It was peaceful there, with a beautiful shipwreck not far from us, the evening light reflected on the still waters. 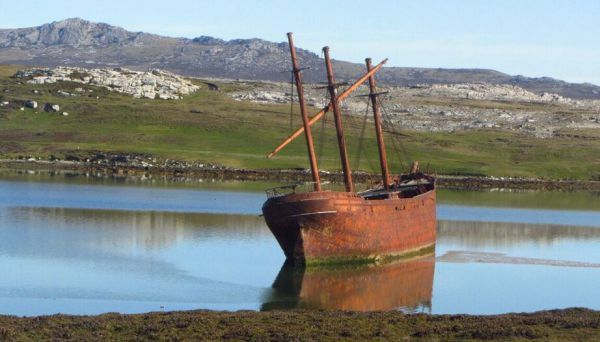 There were an extraordinary number of shipwrecks all over the Falklands coastline. Most of them were wooden boats, which had been abandoned over time, substituted by more modern and secure steel vessels, more suited to the icy waters. 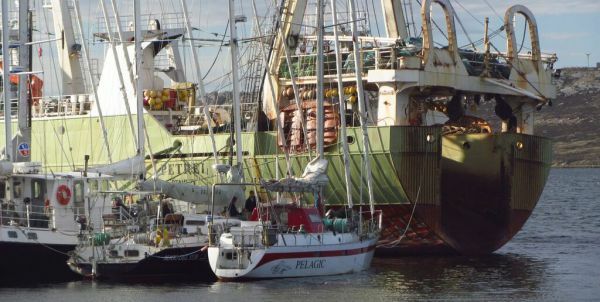 The 16-metre Pelagic seemed ideal for our voyage: a straight-forward, workaday steel boat, bolts and screws in full view, light on electronics and heavy on mechanics – solid and cosy. A large living/galley area welcomed us as we came down the steps: a big table with benches all around it, hidden small bunk beds behind curtains alongside the benches and two bigger cabins towards the bow. From the cabins, access was provided to the lazarette in front, where fresh vegetables and fruit were stored and where Skip had a workbench, kept his tools, sails and the dinghy. Our family had a cabin to ourselves, with the luxury of a cabin door we could close behind us. My fears of feeling claustrophobic soon dissolved. However I felt rather sorry for Elena, who slept right behind a bulkhead, which separated her cabin from the only head on board. This meant that she had to tolerate a 25-pump-manual toilet flush every time one of us used the heads. The second day, we moved our boat into the port of Stanley, which gave us a chance to meet the community of hard-core sailing people who congregate in these ports on their way to the far waters of the Southern Hemisphere. Later we were to run into more of them, at our final destination in Port Williams in Chile – for many the port of departure for the Antarctic. We shared some meals with them, grilling huge chunks of meat on deck and swigging down litres of beer. We met Jerome Poncet, a French sailor, who is a pioneer in the Southern Latitudes. He was already sailing around the world at the end of the 1960s, and his was the first small boat to reach the Antarctic Peninsula. He raised his growing family on his boat (one of his kids was born in Antarctica, on the kitchen table in the galley), until they bought an island in the Falklands, where they settled on a sheep farm. 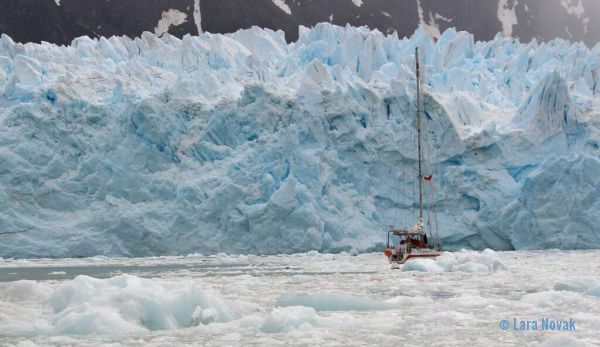 His yacht was the first and only yacht to have wintered so far south in Antarctica. His wife is an Australian biologist and together they conducted scientific surveys for years, for which he was awarded the “Médaille de l’Ordre du Mérite” in 1973 (the French equivalent of a knighthood). He was very charming and warm and we met up with him several times in our first days of sailing along the Falklands. We spent our days in Stanley stocking up on provisions, everyone frantically searching for last-minute WiFi opportunities. We organized oilskin sailing outfits for everyone at Skip’s storage shed, which he permanently hires in the port area, and searched for a Christmas tree for our boat. Two lamb carcasses were brought on board which Skip fastened outside to the back of the boat, exposed to sun and sea water which would keep them from rotting. We went for long walks around Stanley and had a quick peep into the museum before closing time. There, photos and mementos conveyed the history of the few original Falkland families and their daily life. The Falklands is populated by immigrants who settled there over the last 200 years. It is a diverse society, with people of many different nationalities, although most are of English origin. Some of these Falkland families have been on the island for nine generations. Because of their strategic position, in the 18th century the islands were claimed by the French, the Spanish, by Argentina and finally by the British, who set up a colony there. But in 1982, the Argentine military invaded and occupied the Falklands for 74 days, until British forces re-took the islands. Almost 1000 people died. The islanders still feel very resentful towards Argentina, and Stanley is full of monuments remembering and honoring the soldiers and the war. It is still a very sensitive subject and the relationship with Argentina is still fragile. On board our boat there was a tea cup decorated with a map of South America, on which Argentina just simply did not exist, it had been cut out, with the ocean taking its place… Tourist information actually invites tourists to respect that sensitivity and to avoid political discussions. On the day of our departure from Stanley we went to the Seamen’s Mission, just a few miles out of town. It is an organization giving support to sailors, where old clothes are collected for seamen who are travelling through. We were offered one last good hot shower before leaving. After only two days living on board, this shower seemed like such a luxury to us, and thinking back to that now, it is incredible how quickly we let go of the idea of showering regularly. On December 22 we finally left Port Stanley for Carcass Island, following Jerome’s Golden Fleece. He was going to fetch two National Geographic photographers at Steeple Jason. It was a long sail, leaving early in the morning and arriving late at night. Carcass Island lies north-west of the two main Falkland islands and is run as a sheep farm by an elderly Englishman named Robbie McGill. He has owned the island for thirty years and manages a small lodge there. During our stay in his bay, he invited us over several times for tea, coffee and hot chocolate and delicious pastries. The bare mountains of Carcass Island reminded us of Scotland: cold, windblown close-cropped hills and rocky mountaintops. Nearer to the coast and around the beaches, the dominant feature of much of the landscape is tussock, a species of long grass which grows densely in very high clumps (usually about two meters high), proliferating on all the Falkland Islands. Penguins nest under the tussock, and on bare land, they hide in holes in the mossy ground. We reached a beach at the far end of the island, which was dotted with penguins waddling up and down. Skip taught us about the three different species of penguins we would encounter on our journey: the Gentoo, the Magellan and the Rock-hoppers. The Magellan penguins were recognizable by their white stripes, while the Rock-hopper Penguins have bushy eyebrows and mischievous faces. It was now Christmas. The Christmas tree was set up and placed under the steps in the galley on lambskins representing snow. We decorated it with seashells, paper penguins, stars and little trees made out of sticks, coloured balls and golden stars and chains of coloured paper hanging everywhere. Skip added a string of coloured lights which thereafter were kept on and often were our only source of light at night. Two legs of lamb were chopped off the carcasses and we had a festive meal of roast lamb, followed by Skip’s plum pudding, which was drenched with liqueur and set alight. Another of our walks took us across a saddle between the hills to the other side of Carcass, where we found about fifty elephant seals, lying around lazily on the beach, barely lifting their heads to take notice of us, and hardly breathing. 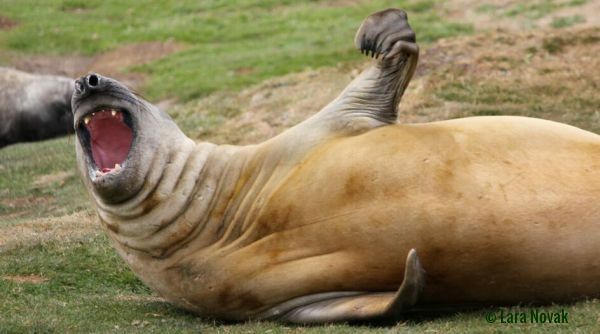 Apparently elephant seals can hold their breath for up to one hundred minutes and they were lying so still that at times we wondered if they were alive. While we ate our picnic at a safe distance, we watched as a couple of them got into terrible fights over the females. Elephant seals’ skin moults in large patches, and we found many of these strange pieces of skin on the ground. 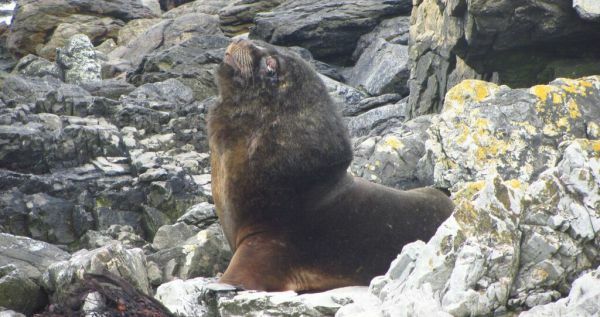 Although they can dive to depths of up to 1500 metres, during their moulting season they are sensitive to the cold, so they mostly lie around on dry land. We came across many elephant seal bones. They were scattered around everywhere, like beautiful white sculptures, along with skeletons of penguins, birds and other creatures, but apparently the name Carcass Island has another origin: it comes from a ship of that name which passed through there in the 18th century. We stayed in Carcass for four nights, until we left for the Jason Islands on December 26. Steeple Jason and Grand Jason were both bought by a New York philanthropist in the 1990s, who later donated them to an American Wildlife Society. Neither have ever really been inhabited by humans and Steeple Jason has never even been used for grazing. The landscape, the birdlife and the colours of the Jason islands made for a unique experience. After a short walk across the island we reached a beach on the other side where we were faced with the most amazing expanse of endless black and white, spread out in front of us as far as our eyes could see. It was the biggest colony of albatross birds in the world. 110,000 pairs were brooding their eggs and caring for their chicks, sitting on their strange chimney-like clay nests. 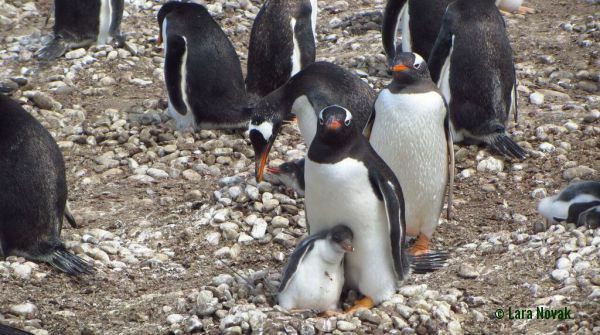 And mingling amongst them, adorable Rock-Hopper and Gentoo Penguins, also black and white, covering kilometres of beach. We watched them for a long time, hiding in the tussock, as they protected their offspring. Every now and then the penguins marched off to the sea, all together or in little groups, waddling in single file, and joyfully diving into the blue waters, where they zoomed around, splashing happily. They were not only funny but also very enchanting to watch. The recurring black and white in the wildlife and landscapes of the Southern Hemisphere is extraordinarily striking. We had yet to encounter the huge black and white dolphins which often accompanied our boat, the oystercatchers with their long orange beaks, the rocks and the ice. All the animals seemed aware of our presence but not threatened by it, as long as we kept a respectful distance and behaved calmly. They accepted us as fellow natural beings, which made me feel more attentive and aware, in tune with nature. On the hilly slopes near the beach, the penguin colonies were surrounded by nasty-looking birds of prey, the caracaras, who were patiently waiting for a good chance to steal an egg or a small chick. At times they ganged up around us and it became a little scary. A couple of angrily shouting caracaras swooped closely over my daughter Ghita’s head, when unknowingly she came too close to a nest with two chicks in it. She was frightened to tears. Even though we each carried an upright stick with us (apparently they go for the highest point when they attack) Livio got his hat snatched off and carried away and he had to climb up a wall of rock to retrieve it. When one of the swooping birds actually drew blood from Skip’s head, we decided we had had enough, but it gave us a thrill. As we were heading back to the dinghy we came across a threatening-looking sea lion, with long yellow teeth, who roared at me when I came just a little too close. The tide had gone down, and he looked as if he were stuck on the spiky rocks, almost unable to move. Our dinghy too was stranded on spiky rocks and it was hard work carrying the heavy load back into the water, slithering on algae and slippery rocks. To round Ghita’s day off, as we got back into the dinghy, she fell into the freezing water with all her clothes on. She was so courageous and managed to laugh about it! Grand Jason was used for sheep grazing until the 1980s and we found the remains of a disused shearing shed on the island, an old wooden shepherd’s hut, with a beautiful iron stove and kettle, bunk beds and other broken furniture and floorboards. Open books were scattered over the floor, (one depicting a portrait of Mao Tse Tung), and all kinds of objects, saddles, ropes, leather strips, shearing scissors and bolts. It was a real dip into the past – in the middle of a wind-blasted field on an uninhabited island. 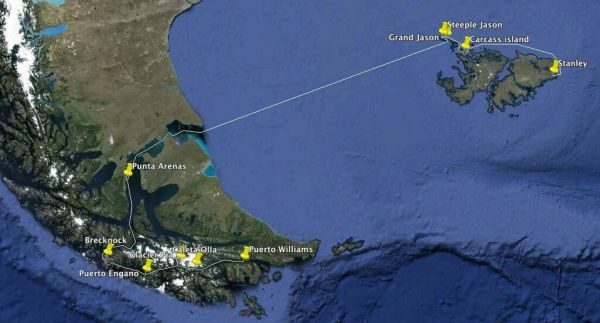 We spent the night on Grand Jason and took off early on December 28th for Punta Arenas, Chile. After three days of sailing, we reached the opening of the Magellan Strait at dawn, where we were greeted by the flames of the oil rigs and the sight of several other boats on our horizon, after days of not seeing anyone. It was the last day of the year. We dropped anchor and waited a few hours for the tide to rise enough to carry us into the strait. This part of the journey was our longest stretch of sailing. During our crossing, the kids were mostly sleeping or playing cards, drifting in and out of seasickness. When I got a little sick myself on my first early morning shift I took pills which made me feel better, but made it so hard to stay awake, that I never wanted to take them again. Eventually everyone got used to the sea. It was definitely getting colder as we headed south-west, especially at night. I enjoyed my night shifts, sitting in the little rigid dodger, covered by my sleeping bag, keeping an eye on the radar. The nights were short, with almost always enough light to at least distinguish the horizon. Skip and I shared our shifts. We had our chats, but mostly we kept silent, and that was extremely enjoyable. The moon was big, up a little later each night. Immigration procedures were complicated. We waited forever on board as Skip went to sort out papers with his local agents, who eventually fetched us with a car and took us to the supermarket to stock up on provisions. We went for a long stroll through the pleasant little town, built around its main square, named Plaza de Armas, like all the other main squares in Chilean cities. A monument to Fernando de Magallanes, with a statue of an aboriginal Indian at its base, dominated the square. We all kissed his worn and shiny big brass toe, because according to legend if you kiss that toe you will return to Punta Arenas… On the square there was a small handicraft market, with stalls of lovely alpaca woollen knitwear, where we bought nice thick jackets for Lara and Ghita. Time in Punto Arenas seems to have stopped – in about 1950! The butcher had a pile of skinned lamb heads lying in the window, and the clothes stores displayed unfashionable lacy dresses. On the other hand even here, in the southernmost end of America, commerce has been invaded by Chinese products. The stroll along the shore was beautiful, millions of birds criss-crossing the skies and coming down to rest at the water’s edge. Some of the buildings along the seaside were decorated with entertaining trompe l’oeil murals. We looked for a nice restaurant for our New Year’s Eve supper, but most restaurants were going to close for the night. Eventually we opted for a simple pizzeria and the delicious pizza made us extremely happy after days of eating mostly soup. By nine o’clock we were strolling back to the boat, utterly exhausted after our three days and nights sailing. We therefore decided that since we were globe- trotters, we could actually decide our own hour, on the dot, to celebrate our transition from the old year to the new. Cape Town had already passed midnight, and it did not seem vital to respect local time. We opened a bottle of champagne at ten o’clock sharp on deck, shared an authentic Italian panettone, pulled some crackers and were all happy to crash into our bunks for a well-deserved sleep. It was Ghita who woke us up at midnight, and chased us up on deck for a little while to admire the fireworks, most of them fired from other ships and boats. Where were the locals celebrating? We rarely encountered other sailing boats, but when others anchored or moored next to us we always connected, exchanged news and discussed weather conditions, and ‘borrowed’ the odd bottle of wine or olive oil if anyone ran out of stock. We often saw them again and again at a distance as we followed similar itineraries along the Magellan Strait and the Beagle Channel. The next day we continued our trip with a 24-hour journey to Brecknock, sailing past the most southernmost tip of the American mainland. We dropped anchor in a spectacular bay, with a big waterfall, surrounded by mountains where traces of snow had begun to appear on the peaks. Using a hose and funnel we filled our 500-litre water tanks. Fresh water seemed like such a precious gift, pouring just like that down the mountain. We cleaned the boat and washed a lot of clothes, while the kids were either paddling around in our kayak or learning how to drive the dinghy. All of them got a turn. Conditions were perfect; sunshine and flat sea. We went for a walk uphill to a beautiful lake in the mountain, and as the weather turned to rain we walked on and on, walking in the rain, protected by our gear. I enjoyed feeling so independent of the weather, walking in nature after days on end of motoring on the sea. At times climbing with the help of a rope, we caught incredible views of several other mountain lakes at different heights. Our walks usually took half a day or more, with scenic stops and picnics. They were always breathtakingly beautiful. We were all happy with the challenges we encountered and grateful for Skip’s driving force and determination. And usually we were also happy when we got back to the boat, completely exhausted. We often scheduled early departures at four a.m., monitoring the tide where necessary, and we had an early start for our ten-hour sail to Puerto Engaño. We soon got our first glimpse of the Pacific Ocean, before we turned south-east into the Beagle Channel. We spent the night in Puerto Engaño without going ashore. As we proceeded down the Channel the next morning, it got colder and colder and snow was beginning to appear on the mountain tops. For the rest of our trip the weather remained stormy, and we could understand why this part of the world had never been colonized. Even though the surroundings were more and more spectacular, we spent less and less time on deck when we were not on watch. We encountered the first few pieces of floating ice when we eventually sailed into the western arm of Seno Pia, into the most spectacular bay of our whole trip! The water was covered in floating pieces of ice which resembled little white whale tails. The bay was dominated by an immense glacier with a palette of color shades ranging from transparent white to deep sky-blue. The colour of the water was a murky light turquoise, seemingly contaminated by the clay of the surrounding morena. Every now and then, huge chunks of ice broke off the glacier and crashed into the water, raising clouds of shattered ice and making the most impressive thundering noises. Apart from that, it was so quiet and calm, after our stormy and windy motor voyage down the channel. Skip decided it was not safe to spend the night so close to the glacier because of the huge chunks of ice raising sudden waves and because it was too deep to drop anchor. We continued on to the eastern arm of Seno Pia, where we were able to keep a safe distance from another glacier of smaller dimensions. 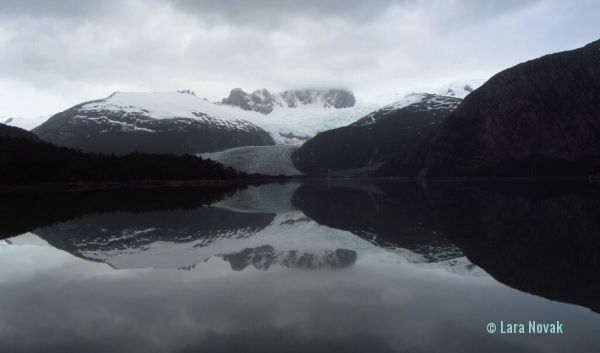 As the others went ashore with the dinghy, Marco and I decided to row to the glacier in the kayak, slowly paddling in dreamlike silence in the rain, between floating little white whale tails. It was magic. On land we approached the glacier safely from one side. It was freezing cold. The ground was soft and in some places we sank into the mud, like into quicksand. At times we were not aware we were actually walking over ice bridges. We chose a spot where we could sit and have a picnic and by the time we walked back to the water, it was low tide. Chunks of ice were scattered over a wide beach and the children picked up huge pieces and enjoyed licking them thirstily. Every now and then the silence was interrupted by immense chunks breaking off the glacier and crashing into the water. With the awareness of global warming in the back of our minds, it was excruciating to watch. Skip and Elena kept remembering how much further the glaciers extended on their previous trips just some years back… But apparently this melting is also a seasonal phenomenon, and while it was melting away at the lower levels, it was snowing higher up the glacier, probably (hopefully) forming new ice. Meals on board were always good. We were slowly beginning to run out of various food items, however, I was relieved when we had our last piece of lamb (I will not be having lamb again soon!). Fresh fruit was becoming scarce, salad was long gone and we were tired of eating cabbage. Now it was the turn of potatoes (bakes and purees) and our first meals of canned food. We had eggs and bacon to the bitter end. In spite of the circumstances on board, Elena spoiled us with the most amazing breakfasts every morning, with a great variety of offers on the menu, taking everybody’s personal orders of toast, oats and cereals, fried, scrambled and boiled eggs. We ate lots of pasta and rice and pulses. We began to bake our own bread and Lara made delicious fruit cakes. When we went ashore we took beautiful picnics with us, crackers and bread, cheese, salami, dried fruit and nuts, chocolate and fruit, and always a flask or two of hot tea. Life on board was tight, but manageable. Our family could close a cabin door behind us and if one of us needed to opt out for a while it was possible. I had feared claustrophobia but as the intimacy grew between us I actually enjoyed the closeness of living on top of each other. I also enjoyed the closeness of our family in our cabin, and the closeness of Marco and me in our bunk. The kids spent most of their time reading or playing cards, and making artworks. It was nice to watch the kids turn creative in the absence of their electronic devices. Seno Pia was not our last stop before Port Williams, but slowly we began to encounter more signs of civilization. A cruise ship made its way into the bay as we were strolling around the glacier and lots of “red penguins” as we called them, came ashore on the other side of the ice, all dressed in identical red oilskin outfits. Even though we only saw them from afar, we slightly resented their presence, after so many days with hardly any human encounters. I caught myself feeling superior to them, but on second thoughts, if it hadn’t been for Skip’s generous invitation, we too may one day have travelled on one of these cruise ships. Not everyone is as lucky as we have been! Our next stop was Caleta Olla. All the children learned how to steer the Pelagic, how to trim the mainsheet, how to read a compass and how to keep an eye on the radar. We arrived there on January 7th. This was the coldest day of our trip and we rugged up from top to toe. The land looked like the setting of “The Hobbit”: soft, mossy ground, land and water merging, grey and misty, with splashes of strong colour. Skip took us to a beach near a river, to search for arrowheads. Apparently the indigenous Yamana people used to chip their arrowheads out of basalt, which they found on this beach. We searched and searched until Luca, the most diligent and observant, discovered a piece that was amazingly intact. 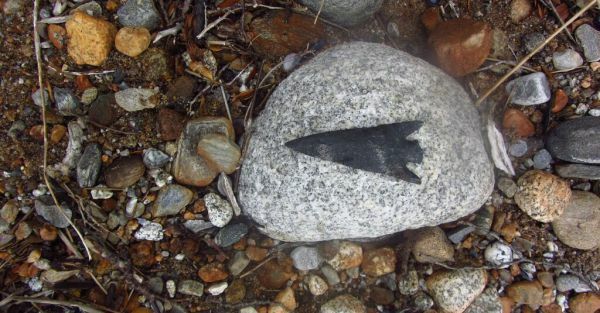 We were to admire the same arrowheads a few days later, exhibited in the museum of Port Williams. They were nowhere near as big and beautiful as the one the Luca had found. The Yamana are the most southern people in the world, traditionally living as nomads in the area of Tierra del Fuego and Cape Horn, where they have been for over 10,000 years. Hunter-gatherers, they travelled by canoe from island to island, the men hunting sea-lions and the women diving for shellfish. Until a few years ago there were only three full-blood Yamana people left: three elderly sisters. When two of the sisters eventually died only one of them was left, a lady by the name of Cristina Calderon, who still lives in Port Williams. She is the last remaining person who speaks the Yamana language. It was clear that we were nearing civilization. The first rubbish began to appear on the beaches. More and more boats could be seen in the distance, as we were passing Ushuaia and heading to our last stop, Port Williams. Finally the wind turned in our favour and we could switch the motor off. It was ice-cold and rainy, but beautiful. The skyline was amazing on both sides of the Beagle Channel, floating past Argentina on our left and Chile on our right. Port Williams was founded in the 1950s as a naval base for Chile and boasts a small airport. The University of Magallanes has a centre here and the town hosts scientific activity linked to Antarctica and the Tierra del Fuego. 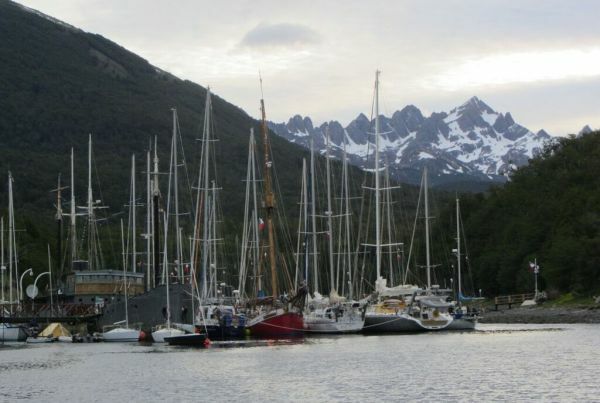 The port also attracts tourists heading for Cape Horn or Antarctica. The harbour was full of sailing boats similar to ours, some enormous and others very small, some wooden, some historical, some modern, from all over the world. There were those who had just arrived and those who had been there for a long time. Port Williams is small and not easy to get to either by air or sea, but still these diehard sailors prefer it to Ushuaia, because it is less touristy and the admin is easier. We had run out of water and were running on a reserve 25-litre canister, but it was too windy to moor and fill our water and petrol tanks. We cleaned the boat thoroughly and began to pack our bags. It was quiet on board and peaceful. We went ashore for our last stroll, slowly reconnecting to civilization and had lunch in a little restaurant. We visited the museum. We had come to the end of our trip. Yes, I was looking forward to the comforts of home at that point, but mostly I was aware that an unrepeatable experience was about to end. Inevitably an attachment had grown, to these free and empty lands of the far South, to its spectacular wildlife, waters and open spaces. Bonding had happened between our families and even separation from the Pelagic brought a moment of nostalgia, as it had served as our home. We drove our dinghy to the airport, just on the other side of the harbour, and climbed up the muddy embankment, carrying our bags to the airport on foot. We boarded a small airplane, maybe a ten-seater at the most, our bodies as dirty and smelly as savages’ ….. and our hearts filled with gratitude.